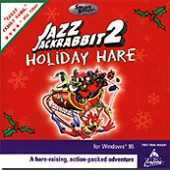 Epic Megagames developed "Holiday Hare" versions of their popular platformers Jazz Jackrabbit and Jazz Jackrabbit 2 as freeware releases to celebrate the holidays. Each game is populated by X-mas themed levels and festive sounds, and features the same furry rabbit hero as the shareware games. Control Jazz (or his brother Spaz) blasting away all kinds of turtles and other creatures in this special edition of Jazz Jackrabbit 2, with five new levels with a Christmas theme, including two new enemies not seen before. This fast-paced platform game also includes multiplayer support (splitscreen, ipx or internet play) with up to 8 players. The game features detailed 2D graphics with resolutions ranging from 400x300 to 640x480. There are no bosses in the game, although the zaniness of the levels more than make up for their absence - and anyone who found the shareware games too difficult will find Holiday Hare a welcome change. Highly recommended, especially for fans of the original games. The Christmas Chronicles released in 2000 is an enhanced version of Holiday Hare '98, featuring Lori as a playable character. This version is based on the engine of The Secret Files.